I am targeting around 1630 which looks very good to me. There are a few support levels, the 61.8 fib is at the same point and they are all very close to the ascending triangle breakout which I successfully traded which was approx 1624. 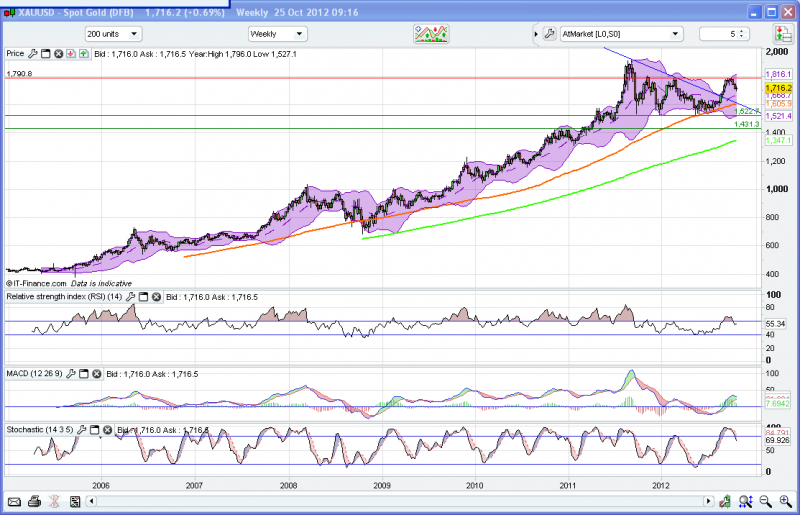 1665-1675 looks ripe for a bounce? Their last call earlier this month was spot on. That person is talking about a triple top on gold. I dont think he knows the meaning of a triple top????? Gold is not in a triple top. Triple top has to come at the top of a trend. Thats half way up. Well thats the way i see things unless things have changed that im not aware of. Sold my gold positions for 13 & 14 pip gains. RG you are 15 pips better of than yesterday all be it on a losing position, so it is a gain. good luck with your holding. This should have been the first chart on the post - this is where most of the analysis is based on so revert back to this. Tried to edit it but wouldn't allow me permission. I hate to post this, but this is my view - long term its bullish, or sideways - short term bearish. I think you will get an area of respite around the 1675/80 area - could range or bounce here for a short period - if it ranges, this could coincide with the 20sma on the weekly and thats - but thats just one scenario. Your the only who can handle your money - but this could get worse depending on how badly managed this trade was. Don't allow yourself to go broke - and don't rely on a wish. i.e don't just stay in this trade because you "hope" that it bounces. Did you have a stop in place when you placed the trade? Long term I fully expect gold to rise just because of QE and inflation effect. if peeps keep buying the USD there is no need to be in Gold. While the Euro is being rubbish, the Yen is on for more QE, the CHF is being pegged by the SNB, seems the USD is the only safe place to go. F'in mental I know but that is the way it is this week. This may not comfort you but I took 2 long positions on gold today at 1702 & 1701 and may add 2 or 3 more as and if it goes down to 1690 with stops ranging down from 1675 to 1665. There is 50% fib and price support there so reasonable chance of a bounce there. That's a nice email you got there Tradesmarter?? Last Edit: 19 Oct 2012 16:38 by ronnie. 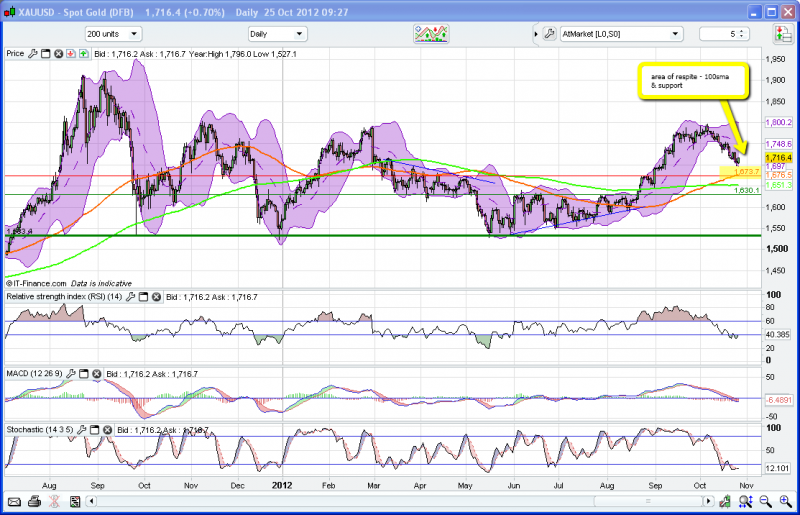 Gold is approaching a few levels of support and maybe it is time for some stake building. And 50% Fib with price support near 1690 area for stops.